The great question: why do I write? I’ve been asked this a number of times, and my answers have been varied. I’ve taken the pretentious route, proclaiming that no one chooses to be a writer, writing chooses you. I’ve tried to brush it off by saying that writing is the only thing I know how to do. The truth is, I definitely do know why I write, but it is difficult for me explain simply. It comes from an experience, a visceral reaction that I now call the Feeling. So what’s a good example of what I’m talking about? Take The Diamond Throne by David Eddings. I bought this book in the late 80’s. I read it in a single sitting in my bedroom. Outside, the sky was dark, full of black clouds, and rain was pelting my window. To the distant rumble of thunder, the flashes of lightning, I turned to chapter one and discovered a knight riding a horse through a storm. Accompanied by the sound of hooves on cobbles, the knight slowly made his way along the streets of the city from which he had been exiled, as the dark sky drenched him with rain. Call it art imitating life (or should that be the other way around? ), but it felt as though the weather outside my bedroom window was the soundtrack for this story, and I was sold. I’m sure that the coincidence in atmospherics is what hooked me initially, and it sharpened up my receptors for what came next. I remember needing to know why this knight was returning to the home that had exiled him. I had to discover what adventures lay ahead for him. I remember battle scenes that made my heart race, camaraderie that made me laugh aloud. There were scary moments that made me acutely aware of being home alone, and that the only light on in the house was the reading light in my bedroom. I welcomed the knight’s friends, despised his enemies, and I wished to be a member of his fellowship that was on a quest filled with such wonder and magic. I was hooked by The Diamond Throne because it had given me the Feeling. The Feeling is investment, the moment a story grabs you by the collar and drags you into the fray . . . it’s being Luke’s co-pilot as he storms the Death Star; it’s taking Sansa’s hand and running away to safety; it’s telling Harry to be brave in his cupboard beneath the stairs; it’s standing alongside Druss on the battlements of Dros Delnoch; it’s begging the crew of the Nostromo to stay inside the ship. There is nothing on Earth like a good story, and I want someone, somewhere, to read my stories and experience the Feeling. That is why I write. 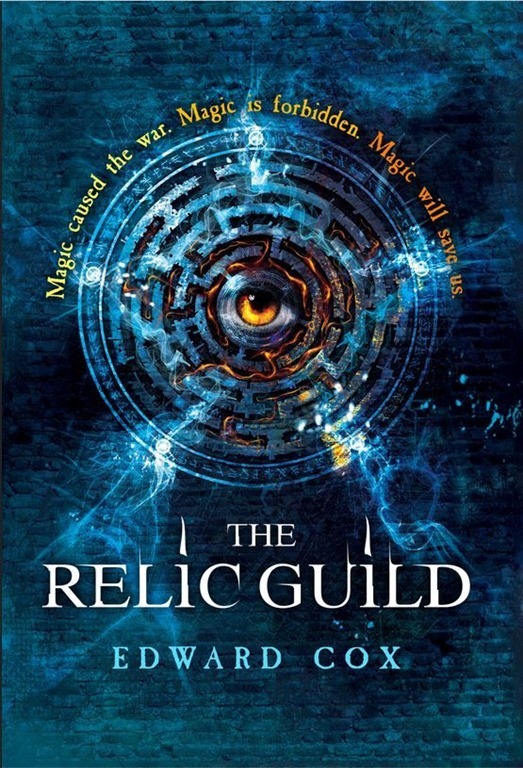 The Relic Guild by Edward Cox is published on the 18th of September by Gollancz in Trade Paperback, eBook and Audio Book. Be sure to visit the other stops on the blog tour (see the banner to the right). Pingback: Edward Cox’s THE RELIC GUILD Launch a Huge Success! | Zeno Agency Ltd. I loved the Relic Guild so much, cant wait for the sequel.